The amaryllis is a bulb plant that is easy to force into bloom. The beauty of the flowers that come in a variety of colors including red, white, pink, salmon, orange and striped and the large size of the blooms make them a popular winter plant. Often they are forced into bloom at Christmas and used to help celebrate the holiday season. The heads of the amaryllis are large and the flower stems are often tall making these flowers popular in cut arrangements. Once your bulb has flowered, don't throw the bulb away. With a little care and attention you can enjoy your amaryllis more than once. Cut the amaryllis flower heads from the top of the stems once the flowers have died back. Use garden shears or a sharp garden knife. Continue to water your plant with the rest of your plants. When the flower stem starts to sag, cut it back to the top of the bulb. 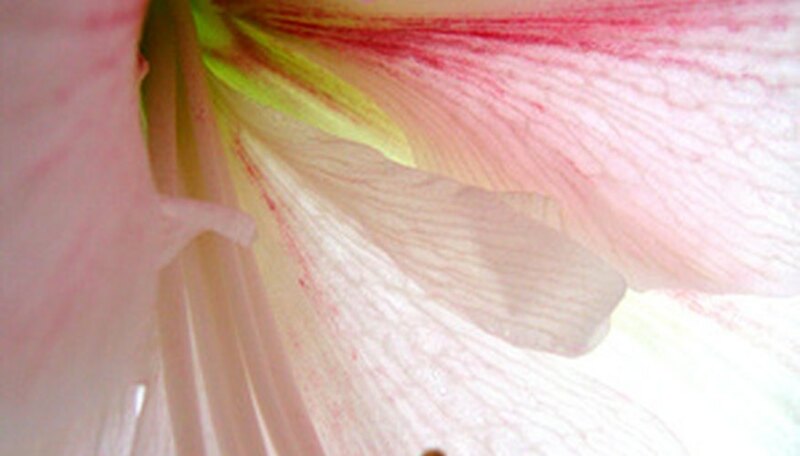 Water and fertilize your amaryllis for five to six months. You want the leaves of the plant to develop and feed strength into the bulb for the next flowering season. When the leaves begin to yellow in the early fall, cut the leaves back to 2 inches above the top of the bulb. Remove the bulb carefully from the planter. Clean off the soil. Place the bulb in a dark, cool place such as the crisper drawer of your refrigerator. Set the crisper temperature to 40 to 50 degrees F. Store the bulbs for a minimum of six weeks. Bring the bulbs out to plant them eight weeks before you want them to bloom. During the time you have the bulbs in your refrigerator you cannot place any apples in the refrigerator as they will sterilize your bulbs. Plant your bulb in a pot filled with potting mix for bulbs. The roots of the bulb are tender so be gentle when arranging them in the pot. Fill in around the roots and bulb all the way up to the neck of the plant. Press the soil firmly to remove any air pockets. Place the potted bulb in 68 to 70 degrees F in direct sunlight. Water lightly until the flower stem appears. As the bud and leaves appear you can gradually add more water. Once it begins to grow it will usually grow quickly. The flowers should bloom in seven to 10 weeks. Space out the planting of your bulbs so that your amaryllis display lasts the entire winter season. Overlap your planting schedule every two weeks; this will keep bulbs in bloom over a larger range of time.